So I've been at the Recurse Center for the last 8 weeks, mostly working on implementing the conceptual core of git in Haskell as a way of learning both Haskell and git. I learned a lot about how repositories are implemented under the hood that I thought it would be useful to know. I prepared a 5 minute presentation that didn't go over well, but I had a lot of success with people one-on-one walking them through a .git folder. I wanted something more scalable and interactive so I decided to prepare a workshop. I thought about the work involved in making this repository: cherry-picking, rebasing, editing. What if I make a mistake somewhere and have to do a lot of tedious manual work all over again? I spun my wheels for a while. Hang on, don't I already have a way to make the history that I want? 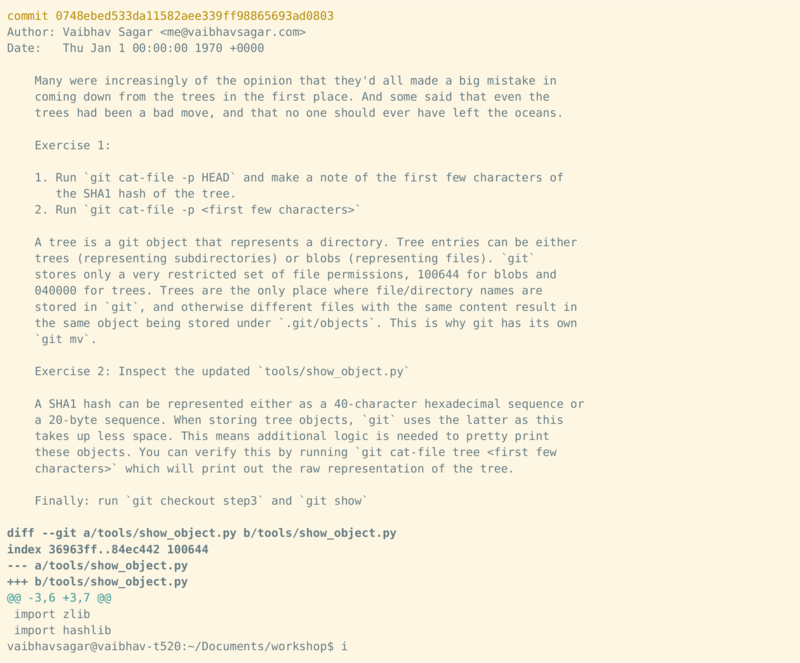 So I wrote some code that takes the directories I want in each revision and links them together as a valid git repository!